Hariyali Ginger Paniyaram or spicy appam recipe is basically a south indian recipe with a yummy variation. Grind ginger green chillies and coriander to a smooth paste in a grinder using little water. Grind suji and add yoghurt,water and make a smooth batter. Now add green paste in it add salt and cumin seeds and mix well. Keep it aside for 20-25 minutes. Now take the paniyaram pan/ mould and gently rub or add few drops of oil in all the holes-depressions. Now add fruit salt in the batter and mix well. Pour a spoonful of batter in each hole. Cover and cook for 4-5 minutes or till it has a few brown spots. When done, turn to the other side using a spoon or paniyaram stick and cook for another 4-5 minutes. 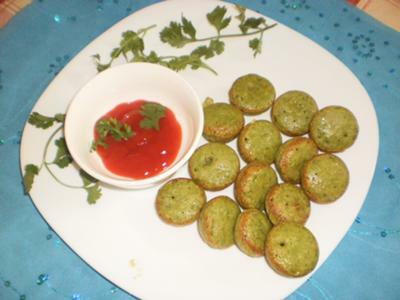 The paniyaram moulds or pans are available in iron or in nonstick pans. From the name of the recipe I hope that it is an Indian one. I had eaten appam once when I went to Kerala and I liked the food very much. I am a vegetarian and would like to know more about making appam. Could you please share? Very good recipe. I am going to try this.